There are few things more satisfying than watching your little girl jumping with glee inside a Disney Princess bouncy castle, but I can still think of a few. How about when she jumps into your arms to thank you when she comes out to see her Disney Princess Bounce House? Or maybe when mom jumps into your arms with a kiss because you made her party the best one on the block with the bounce house rental from Ohio’s best party rental company, Game Craze. 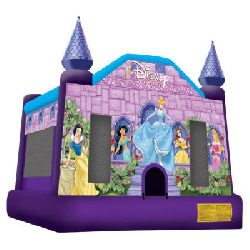 Our Disney Princess Bounce Castle is made by one of the most popular manufacturers in the moonwalk rental industry. Because we are always striving to be the best inflatable rental company in Ohio, we are very careful to buy only the best inflatable rental units. The Disney Princess Bounce House is no different. It is made with premium materials to make sure your kids bounce higher and longer than ever before. Every inflatable that we rent is always a quality, commercial grade inflatable rental.